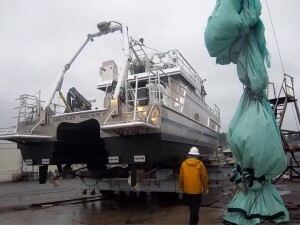 The process of building the R/V David Folger. Tom and crew sent this last night. Construction, inspection, and testing are over! The builder has sent a revised stability booklet that allows eight passengers and one crew member on the upper deck in any condition of loading, including while the crane is being used. The US Coast Guard may not accept the total of nine because their deck-area rule probably allows only eight total. However, we don’t mind if the boat has a greater stability margin than is needed in service! 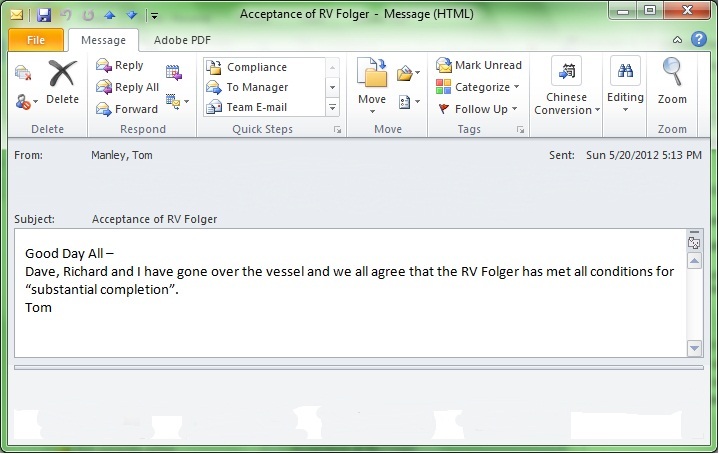 Dave Weed recommends that the College notify AAM that we consider the R/V David Folger substantially complete. 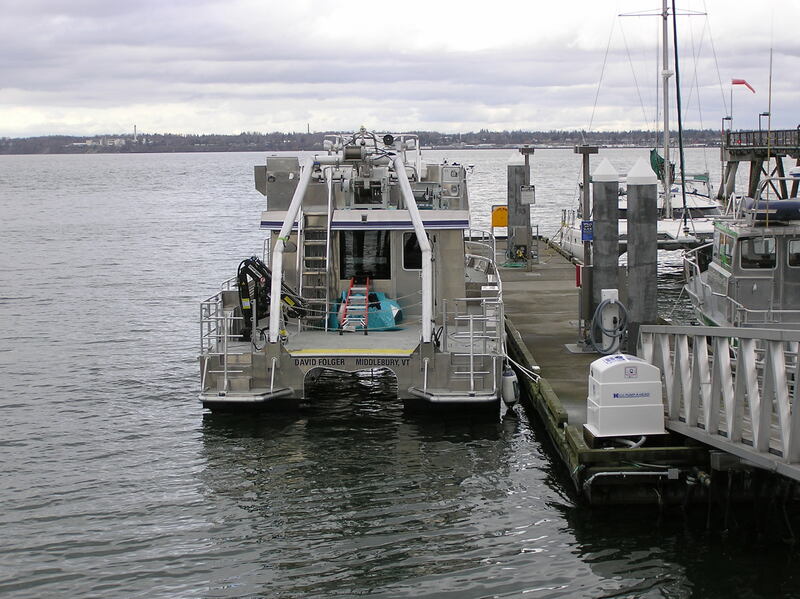 The transport ship will load the R/V David Folger on the 24th or 25th of May in Victoria, British Columbia. In order to get the zillion things done on the vessel that we need to do before transport, Richard and Tom will fly out to AAM on Friday the 18th. They’re hoping that the boat transfer papers can be completed by or before then so that they can take the vessel out for “stick time” and equipment testing. They plan to do that every day for at least two hours daily, possibly multiple times per day, until they leave for Victoria. Two minor issues remain. The inspector is wondering whether the DC power system provides suitable emergency lights. 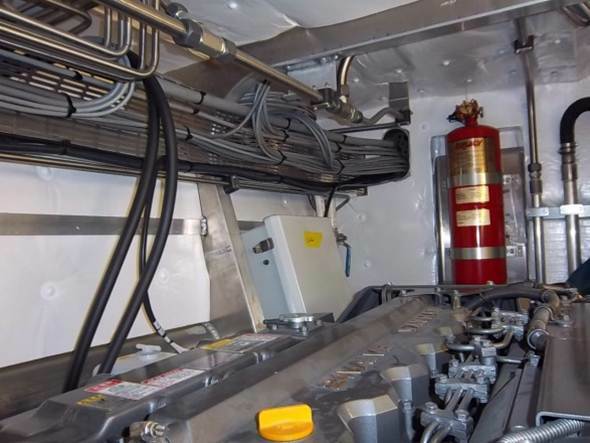 Because the R/V David Folger’s power system switches from house to engine banks automatically if the house side goes dead, she believes that our setup satisfies the auto-on requirement in the CFR, since the lights would never go out. She is checking with her boss. If the decision is negative, we may be able to install some of those battery-powered tap-lights in a few places and meet the requirement. The other concern is the position of the starboard engine-room fire extinguisher, which is mounted above the port side unit on the house aft bulkhead near the ladder. It’s no more than five feet from the engine hatch, though, so she said she will accept the install if USCG Vermont finds it acceptable. Vessel speed, loaded to the contract performance weight simulating 8+2 persons (plus gear) and running at 90% power, was 23.5 knots — well on the high side of the 20-24 knot range stipulated in the contract. However, the port-engine maximum RPM reached 3305 upwind and 3310 downwind at the simulated 18+2 persons weight. We’ll have to watch this, because these readings are slightly over the Yanmar warranty limit of 3300. Dave signed off on 95% of the electrical checks this afternoon. Lights, outlets, all exterior lighting, and so on… A few other items yet to go, but manufacturing is close to complete, too! 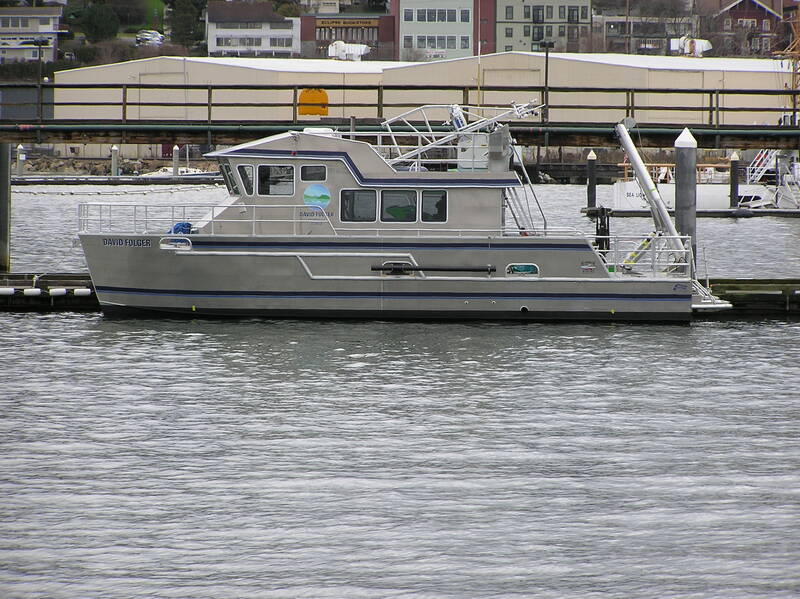 The R/V David Folger will be a documented vessel, meaning essentially that it will be registered. Vessel documentation is one of the oldest functions of the U.S. government, dating back to the 11th Act of the First Congress. Documentation provides conclusive evidence of nationality for international purposes, provides for unhindered commerce between the states, and admits vessels to certain restricted trades, such as coastwise trade and the fisheries. The U.S. Coast Guard assigns all documented vessels an “official number,” which is somewhat like the VIN number in a car. The official number is preceded by the abbreviation “NO.” and must be marked in block-type Arabic numerals at least three inches high on some clearly visible interior structural part of the hull. The number must be permanently affixed so that alteration, removal, or replacement would be obvious and cause some scarring or damage to the surrounding hull area. Today the USCG notified us that the Folger’s official number will be 1238983. Of course, it has to pass inspection first! Our lady of the lake makes her slow and stately way to the water. The R/V David Folger was launched today at long last! Builder’s trials and Coast Guard inspection can now begin. Tom and crew will head out on March 11 to install the computers and peripherals, learn the ins and outs of running the vessel, and create the punch list. She is nearly ready and soon will start her journey to Vermont. At home in the water at last! Shortly after she arrives at Lake Champlain, she will start her first research work up in Mississqoui Bay, which will include senior thesis work by two geology students. She’s also slated to be used for our Alumni College at the end of the summer and three different Middlebury College courses (Oceanography, Marine Geology, and a First Year Seminar) this fall. The vessel will be in the water February 24, and all remaining ECPs must be either approved or rejected by the New Vessel Committee ASAP so they can be installed before that date. The committee will try to make most of these decisions today, because some orders for this equipment require long lead times. We also must wait, as always, for NSF authorization before we can purchase anything. We’re working with committee members to get the votes in by the end of the day today. We are now down to virtually the last expenditures to be made on the vessel. Tom is confident that the College will still have several thousand dollars left to make any small alterations needed by early March. If nothing more urgent comes up, the priority for these funds is to purchase spare props and shafts before the vessel leaves for transport and the construction contract comes to a close. We’ve revised the plan for finishing the deck—again. The original plan was to use nonskid paint, but we heard about a blasting process that roughs up bare aluminum, making it nonskid and also avoiding the need to repaint periodically. That option seemed likely to save maintenance dollars, so we decided to blast the deck instead of painting it. But then we learned that bare aluminum decking is highly susceptible to staining by petroleum products and other chemicals. Back to Plan A! All of the walking surfaces will be finished with a garnet sand nonskid paint. The leading edges of the stairs will wear away before the rest of the surfaces do. When metal stairs are wet, they become slippery and are a potential injury hazard. The steps leading down to the swim platform are of course always wet, and the ones leading up to the 01 deck, the bow along each side of the vessel, and the wheelhouse, galley, and bunks all eventually get wet whenever the deck is wet. Therefore we’re strongly recommending that we install textured nosings and treads on all steps to mitigate this hazard. The treads we’ve chosen also have a night-glow feature: the leading edges of the stair tread are treated with phosphorescence, so they glow for several hours after sunset or lights-out. We’ve also opted for vertical conduits on either side of the lab to permit shorter cable runs between the computers. Petar suggested this improvement, which will also improve our ability to troubleshoot any future problems. Still working on alarms for the CPUs. We discussed this issue in some detail at the most recent meeting of the New Vessel Committee. In the current design, the computer systems in the enclosed CPU rack will be protected from overheating by cooled air routed through the rack from the HVAC system. But what happens if the HVAC system fails? Tom has asked AAM to provide a quote to install an alarm system in each CPU rack, powered by the ship’s 12-volt direct current, with automatic set points for these alarms located in the wheelhouse. We can probably buy cheaper self-contained systems, but those rely on batteries. Schematic of a CTD profiler, showing the layout of the rosette. We’ve discovered that we won’t be able to install the knife gate mechanism for the ADCP (funded by our MRI grant) because the design of the new research vessel doesn’t have enough space for it. Without the knife gate, deploying and servicing the ADCP will be somewhat more difficult. 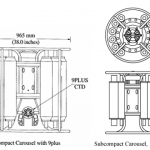 We have asked NSF for permission to use these funds towards purchase of a Conductivity Temperature Depth (CTD) profiler/rosette system instead. 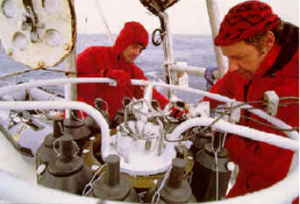 A CTD/rosette system in use on a research vessel. 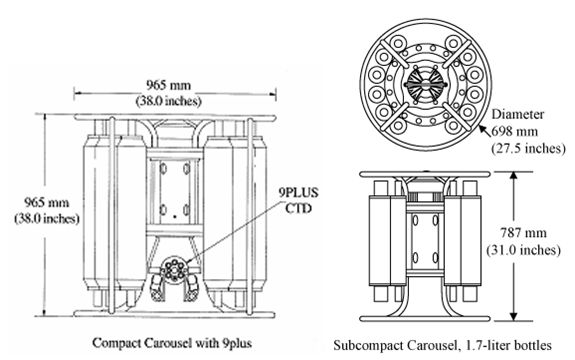 The unpainted steel cylinders in the carousel are used to collect water samples for analysis. This piece of oceanographic equipment, like the other equipment purchased with the MRI funds, will further the use of technology for teaching undergraduates. If we are allowed to use the funds this way, we’ll need to make up the difference in cost. Middlebury College and a local foundation will help. During our latest trip to AAM (October 24 to 26, 2011) we decided to install LED lights in most (98%) locations, instead of the incandescent bulbs initially specified. This switch will conserve energy and make the research vessel more efficient. We had to ask NSF to release a small amount of our contingency funds to swap out the bulbs, but they agreed readily.